Indian citizens buy a LOT of gold. Macquarie bank estimates that 78% of India’s household savings are held in gold, more than any other economy in the world. Right or wrong, this much savings in gold creates a drag on growth, because the available funds for bank lending decrease. So as you probably know, the Indian government has been trying for years to curtail demand. Just since I’ve been a precious metals analyst, there have been three separate gold monetization schemes offered by government officials. "Deposit your gold in the bank and we’ll pay you interest!" goes the offer. The first ones didn’t really work, partly because the rate of interest offered was too low. But the Indian government didn’t give up, and their recent efforts have started to make a dent in gold demand. Not only has the most recent monetization scheme been more effective (due in part to higher interest rates), but the government’s demonetization of 500 and 1,000 rupee notes last November has had an impact, too. Demand figures for 2016 are now trickling in, and Indian gold imports for 2016 were 570.8 tonnes, a whopping 44% decline from 2015. This is a 13-year low. So, will Indian citizens stop buying gold? Indians won’t stop buying gold. But demand could certainly remain subdued if government interference remains at the level it’s at. So what will Indian investors do? • They will buy silver instead. How do I know they’ll buy silver? Beginning in 2013, silver jewelry demand in India has skyrocketed. It’s more than tripled in three short years (2016 data is not yet available). And in the past 10 years it’s up over 600%. As the tariffs and taxes and tricks and teases from the government have had a deeper impact, Indian citizens have increasingly turned to silver, which has almost none of the government interferences that gold does. Did you know that India was the world’s #1 buyer of silver long before they were the world’s #1 gold buyer? They bought so much silver, in fact, that in the early 1900s the government ran into the same fiscal problems that it has today with gold. And the government responded in the exact same manner back then, too: in 1910, it more than doubled the import tariffs on silver, from 5% to 11%. Not surprisingly, silver demand fell 29% by 1912 (according to a report by gold wholesaler Pixley and Abell). The fall in silver demand was attributed to not just the tax increases, but also due to—and here’s our point for today—a substitution of gold for silver in people’s savings, because gold became more affordable on a relative basis. Silver imports continued falling and gold imports continued rising until India eventually became the world’s largest gold consumer, a title they held for almost 100 years. So we have historical precedence that not only have Indians been huge buyers of silver, but have willingly and overwhelmingly turned to another precious metal when one got too expensive or difficult to buy. It is certainly no stretch to think that they could do it again, and as the chart above shows, the process of switching to silver may already be underway. So what could happen to silver if this trend picks up steam? It’s true that a prolonged reduction in Indian gold demand could be a drag on the gold price. Let’s be conservative and estimate that Indians shift just 10% of the money they would normally invest in gold and instead buy silver. Look at what would happen to worldwide silver demand. 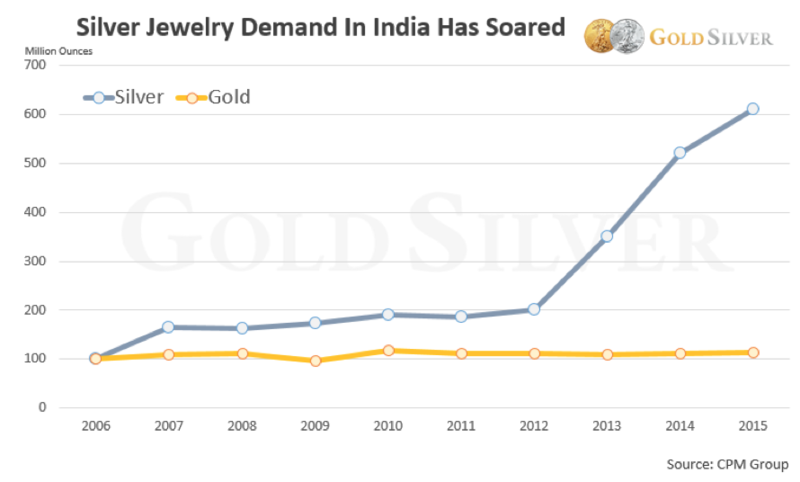 You can easily see that just a 10% switch from gold to silver inside India would result in a massive increase in global demand. Overall demand would grow an incredible 65% in that scenario. And as you can probably surmise, this amount of silver is not available. Mining and scrap would be unable to fill a gap of this size. The pinch on demand would be real, and global. Further, the silver price would be forced higher from this factor alone. Potentially much, much higher. All this from just a 10% shift in their investment funds. 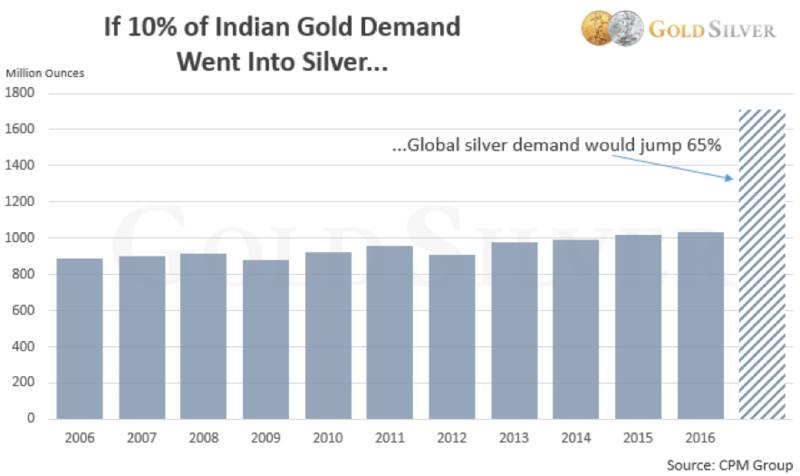 The bottom line is, if Indians begin to earnestly substitute silver for gold, we can expect a major silver supply crunch and a subsequent massive increase in its price. Keep in mind that the investment community is unaware of this possibility. A development of this nature would catch most investors completely off guard—and spark a run on silver in addition to whatever else may be occurring at the time. It won’t happen overnight, but if this trend gains some headline-grabbing traction, look out… prices will catch fire, and the supply deficit would last for years since it couldn’t be easily corrected. Hold on my friends, this is gonna get fun. Make sure you own enough ounces to take advantage of the big days ahead for silver.